8th November 1866, Little Missenden, Buckinghamshire, England. 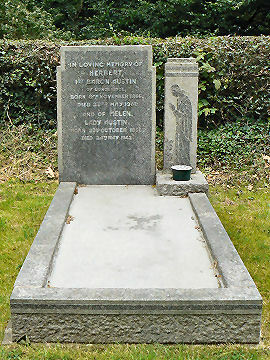 Herbert Austin was the son of Giles Stephen Austin a Yorkshire Farmer and Clara Jane Simpson. Rotherham Grammar School and Brampton Commercial College to study Architecture. He then emigrated to Melbourne Australia with his uncle and served an apprenticeship as an engineer at Langlands Foundry. 1882: Austin went to Melbourne, Australia to join his uncle as a works manager of a general engineering firm. He went on to work for six other engineering firms. 1893: He was asked by Frederick Wolsey, whose company he was now working for to return to Birmingham, England to supervise a sheep shearing equipment manufactory. 1895: Austin built his first experimental car, a three wheeler steered by a tiller. 1896: The prototype of his second car was exhibited at the Exhibition at Crystal Palace, London. 1900: Austin entered a four wheel car for the Automobile Club of Great Britain 1,000 mile challenge. The single cylinder car won first prize. 1901: The Wolseley Tool and Motor Car Company was begun at Adderley Park in Birmingham and Austin became Manager. He became a founder member of the Midland Automobile Club. 1905: After taking Wolseley cars to world renown he resigned and looked around to start his own business. He found an out of town site at Longbridge which was then seven miles from the city of Birmingham and with the help of financial assistance from friends he bought a small derelict printing works and began the Austin Motor Company. Austin went to the Motor Show at Olympia in London on November 17th and received his first orders. 1906: The first car, a 25 hp Endcliffe Phaeton costing £650, was produced and soon skilled craftsmen made their way to Longbridge, manufacturing 120 cars in the first year. 1908: Three special racing cars at 100 hp were produced and entered in the French Grand Prix. The car driven by J.T.C. Moore-Brabazon came in a creditable fifteenth. Production of the main road cars was now so popular that a night shift at the factory was introduced. New models were developed and the factory turned out a thousand cars per year. 1912: The company expanded into manufacturing marine engines and a Saunders of Cowes craft powered by an Austin engine won the British International Trophy. 1913: A two-ton lorry was produced establishing Austin as a manufacturer of commercial vehicles. 1914: The company went into public ownership in February and expansion was planned but then came the outbreak of the First world War. The factory moved over to making munitions for the war effort as well as vehicles and aircraft and by 1917 had trebled in size even having its own airfield on a local hill. 22,000 people now worked at the factory. Austin was knighted for his services to the war effort. Sadly his only son was killed in France during the War but was survived by two daughters. 1918: At the end of the War the Austin factory went back to producing cars only and concentrated on a 30 hp model, which was sold for the staggeringly low cost of £495. He began to take an interest in politics and served as the Conservative Member of Parliament for Kings Norton, Birmingham until 1924. 1920: Austin began working on the concept of a smaller car to meet the needs of the family and because he received great opposition from his board he financed the project himself. 1922: The new car designed by a small team under Herbert’s direction and called the Austin Seven was unveiled to the public in July. 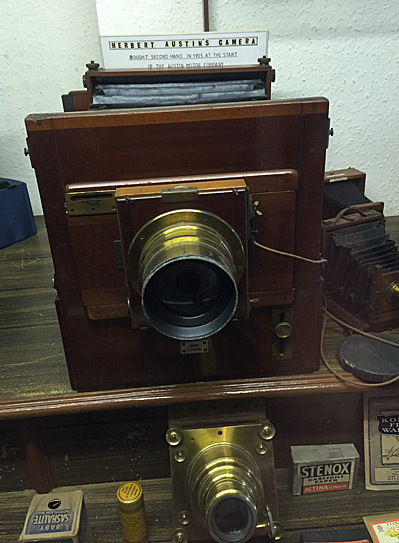 It quickly became known popularly as the “Chummy” and sold for a mere £165. Sales began slowly. 1924: The size of the engine in the Austin Seven was increased and other refinements such as an electric starter were introduced. 1926: The project was now considered a success and production passed the 14,000 per year mark. 1928: A new version nicknamed the “Top Hat” was introduced. 1930’s: This period saw a continuous array of small changes and refinements to the Seven being introduced. 1936: Austin was made a Baron for his philanthropic works which included support for Birmingham General Hospital. 1939: At the beginning of World War Two the Longbridge factory was again turned over to the manufacture of military equipment, including aircraft. (1948): Heavily modified Austin Sevens became the foundation point for the Lotus Car Company. 23rd May 1941, Lickey Grange, Bromsgrove, Worcestershire, England. 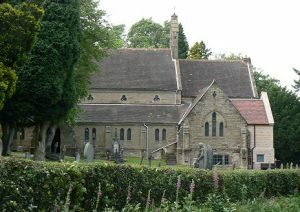 Holy Trinity Church, Twatling Road, Bromsgrove, Worcestershire. His wife is buried next to him in the same plot. Longbridge Motor Factory. (now demolished and replaced with a shopping precinct and houses). The Norton Collection Museum, 26 Birmingham Road, Bromsgrove. Lickey Grange House, Bromsgrove, where he lived and the Austin 7 was conceived in the billiard room.